Trend Analysis is an innovative feature to enable quick evaluation of bike and run performances based on Heart-Rate and either Bike-Power or Run-speed, without uploading data from a variety of devices. Using the average HR and the average run speed or bike power we can apply a best fit line which is both a predictor of performance and also indicates how far above or below the trend line each activity was. Furthermore, plotting this percentage difference (above or below the trend line) over time we can establish if our performances are generally improving or deteriorating. The feature presents all performances, regardless of speed/power, in a format that allows them all to be compared and trends in the athlete's performance evaluated. 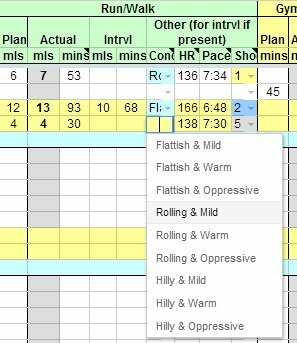 In addition, when a run is logged with HR, or a ride is logged including HR and power (normalized power is best) a brief pop-up will appear in the corner of the log giving immediate feedback on how the performance compares with the predicted trend line. Firstly, a simple plot of all bike performances in the first 10 weeks of the year. The color-coding is to give an -at-a-glance view of in which months workouts were performed. (Within the athlete's log, clicking a dot gives more details about the workout). The black line is the best fit, so the better the performance, the lower below the line it falls. Obviously cardiac drift, heat and the length of a workout add noise to the data. This feature will later be enhanced to try to mitigate those factors. If we measure how far each workout falls from the best-fit line, we can get an idea how the ride or run compares with typical workouts by the athlete, regardless of whether it was an easy jog or a 5k race. When the athlete logs a workout they also receive immediate feedback of this information in the form of a small pop-up box in the corner of the page which briefly details how this performance stacked up against the athlete's typical efforts. menu for each run describing heat and terrain, in the optional "Run Conditions" column. Reflecting these factors will allow better correlation and evaluation. This capability is added to versions 15.02 and above (2015 and on). We often record heart rate over ONE specific harder period of a run workout and are interested in how that performance compares with other runs in terms of heart rate trend across different paces. IF the time and distance fields of the optional interval columns (shown above as 68 mins hard) for either bike or run are populated then the pace/speed fields will reflect this section, not the actual time & distance of the entire workout, and the trend analysis tool (which only runs if heart rate is present) will assume that the heart rate applies to the section/interval. For bike rides, it is also assumed that if power is entered, this applies to the interval if the interval fields are populated. The trend analysis would be inacurate if for example using data from two runs done at 8:00/ml when one was 10 flat mins and the other 2 hilly hours, so the tool also tries to calculated an "effective" heart rate converted to if the run was 1 hr long. Furthermore for runs, it assumes that the run was relatively flat and temperate but if the optional Run "Conditons" field is populated for example as "Hilly & Warm" then adjustments are applied to the effective heart rate used by the tool in order accurately compare with other workouts. In the "Performance" graphs where we show how from from the expected result each workout is, throughout the year, a 2nd-order polynomial trend curve is shown (in red) in order to evaluate where the athlete appeared to be improving or regressing. Note that 2nd order polynomials can have up to only one inflexion point, which ought to suffice for most purposes. Accuracy could be improved by extrapolating or interpolating HR to allow for cardiac drift, since we know the length of the workout. If the data was made available we could try to account for heat and humidity, and in the case of running, for hills.